Twelve South’s classic book-style iPhone case has been protecting and concealing iPhones for over a year now, but if you weren’t a fan of the original brown leather design, you can now get the BookBook in black. If you're unfamiliar with the BookBook, it's a case that resembles a vintage book. 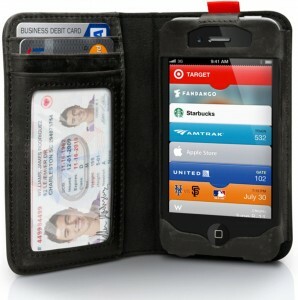 This stylish iPhone holder also doubles as a wallet, with an included ID window and slots for both credit cards and cash. Because it’s a wallet and a phone case, you can carry less in your pockets while guaranteeing that your wallet never gets left on the dresser again. Let’s face it - while we may leave our wallets behind, our phones are always on hand. And if you do lose it? There’s always Find My iPhone, which will Find Your Wallet too. Each BookBook, now available in both Vintage Brown and Classic Black, is made from hand distressed leather with openings for both headphones and charger. There’s no case on the market that’s quite as svelte as the BookBook; even Pad & Quill’s similar Little Black Book can’t compare. You can purchase the new Classic Black BookBook from the Twelve South website for $59.99. 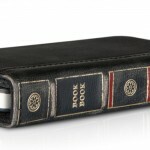 Want one for your iPad or your iPad 2? Twelve South makes those too.